PIE by Sarah Weeks. Scholastic Press, 2011. Currently available. Face Value: It certainly grabbed my attention. I look at this cover and have a slew of questions: Why is the cat staring at that pie? Why is the pie floating? How can that picture of a not real pie look so delicious? Why am I not eating pie right now? Where can I get some pie? There’s also something retro and really appealing about the aqua and cherry red color scheme. 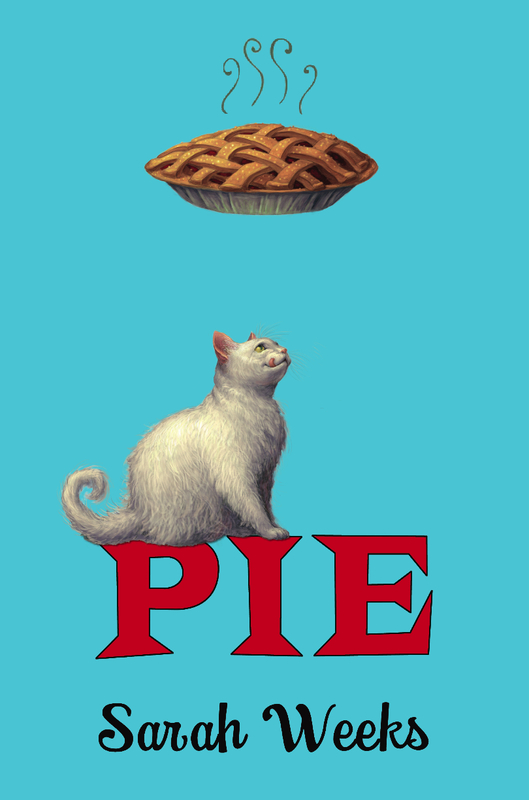 I like this cover a bunch because it’s clean, simple, and showcases the most important thing: pie. Does it break the slate? This book features two really lovely Slatebreaking characters: Aunt Polly, for whom this story is a sort of posthumous tribute, and her niece Alice. Even though Polly is dead for most of the book, she had a huge impact on people’s lives in her little town. Everyone remembered something special about Polly. Her presence in the community meant a lot to many people. She used her gift for pie baking to bring joy and financial success to the town, rather than using it for her own profit. She was a pretty neat lady, and I would definitely call her Slatebreaking. Alice gets Slatebreaking recognition for different reasons. She’s whip smart, persistent, and she doesn’t let those wet blanket adults stop her from solving a crime. Who would we give it to? Young readers who like to help out in the kitchen or who fancy themselves to be junior detectives. It would also be a great book to share with any child who has ever been told that they have an overactive imagination. In a historical moment for the Slatebreakers blog, I will be trying something new with this review. As usual, I will review the book. Then I will bake a pie from the book and I will review the pie. Warning: What follows after the jump may make your stomach growl. Book Review: Polly Portman is a town treasure. Not only does she have a charmingly alliterative name and a warm personality, she also owns a pie shop at which she bakes the most delicious pies you have ever tasted. And then she gives them away. That’s right – Polly Portman bakes amazing pies and offers them free of charge to her friends and neighbors. She has built up a tourist industry because people come from all over to taste her magnificent pies. So it’s understandably a big shock to the whole town when Polly Portman dies suddenly at a young age, leaving many empty bellies and sad souls behind. One of the bereaved mourning Polly’s death is her niece, Alice. Alice spent most of her free time at the pie shop. She occasionally helped Polly with food preparation, but mostly she just enjoyed stimulating conversation with her aunt. Alice found the pie shop to be her sanctuary because she doesn’t have a great relationship with her mom, who can be a bit pushy. Although Alice spent hours and hours watching Aunt Polly bake pies, she never learned Polly’s top-secret piecrust recipe. No one did. And after Polly’s death, everyone is clamoring to find out how to make a delicate, flaky crust just like Polly’s. Alice thinks that she will be the lucky heir to Polly’s recipe. But she’s not. Instead, she inherits Aunt Polly’s nasty old cat, Lardo. And who did Polly leave the recipe to? The cat. As Alice tries to figure out how to get a piecrust recipe from her new pet, lots of hijinks ensue. Crazy stuff is happening around town, including mysterious behavior from the school principal and break-ins around town. Alice smell a mystery and is soon one the case, hunting down clues and drawing sharp conclusions based on observations that most adults would have been too busy to make. It is great fun to follow the case from Alice’s perspective and to feel her joy when she makes a discovery, and the subsequent disappointment when she hits a dead end. There is freshness to the mystery element of this book because it is young Alice’s first chance to try out her detective skills. You don’t have to worry about any of the stale plot elements or predictable character behavior that comes from a mystery in a series, because every discovery Alice makes is new and bright. I love Alice because she is so inquisitive. She is at first proud of her overactive imagination because her Aunt Polly always told her it was a good thing. But when her mom chides her for being so outlandish, Alice tries to quell her gift. She soon realizes that her imagination is the key to her existence and that she would never be happy without her wildly creative ideas. This book features a great boy-girl friendship that is good natured, and fun to read. Alice accidentally makes friends with neighborhood boy Charlie, and together they combine their talents to figure out who is behind the strange events in their town. Although there are some moments when the friendship has romantic overtones, Weeks quickly turns them around and brings it all back to a nice platonic spot. This friendship, and the characters in this story, may be a bit twee for some readers, but I fell head over heels for the golly-gee 1950s setting and broadly drawn characters. A few elements of this book were not quite as charming as the rest. At the end of the book, a big fancy corporate businessman swoops in and saves the day – which certainly resolves the story in a pleasant way, but it takes away Alice’s power as a character. I wish that the exciting developments at the end of the book had been a more direct result of Alice’s actions. I also didn’t like the epilogue. It was painfully unnecessary. It’s not quite as bad as the epilogue to Mockingjay, but it’s up there. I didn’t want to see Alice grow up, and I didn’t want to know what happened twenty years down the line – it sort of spoiled the fun for me. So I’m just going to pretend I didn’t read it and imagine Alice’s life moving forward in a different way. This book triggered an unexpected forlornness because it reminded me of the loss of Pushing Daises. I am so bummed that show is not on television anymore. Where are you, Ned the piemaker? I hope that he’s floating around in that magical universe where fictional characters live and that he runs into Aunt Polly. I think they would be friends. Pie Review: There are fourteen pie recipes sprinkled throughout this book, which made it mighty hard to read because my mouth was constantly watering. In her author bio on the back cover flap, Sarah Weeks says that she made all fourteen pies. Her favorite was cherry and the runner-up was buttermilk. Now, I’ve had a few slices of cherry pie in my life. (I lived in Door County, WI for a while – of course I’ve had cherry pie. They practically hand you a slice once you cross the county line.) But I have never tasted, or even seen, a buttermilk pie. So that’s the one I decided to make. For the crust, I used my mother-in-law’s recipe. She recently gave me a piecrust tutorial and I tried to put her tips into practice. 1) Don’t over-handle the dough. 2) Roll from the center outwards. 3) Use high-quality flour – she says Gold Medal is the best. Here’s my crust. I’ve never done a non-fruit or non-pumpkin pie before, so I have never baked it separately. 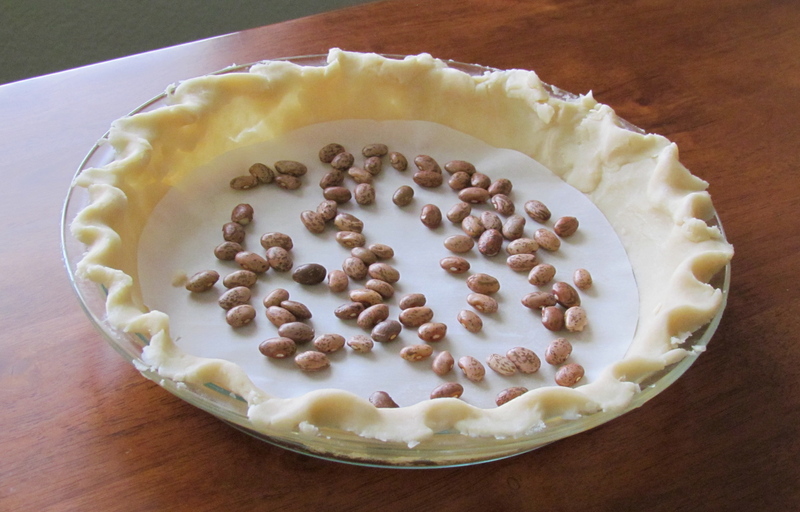 Look, I even filled it with dry beans like Aunt Polly did in the book! The crust was a disaster because I had to piece it together and my edge pinching isn’t very pretty. It’s passable. The end result. I burned the crust a little, and it’s lopsided because my oven is lopsided, but I think it looks pretty darn good for a first effort. Now, for the taste test: I was surprised by the tangy flavor of this pie. I expected it to taste like a sugary custard – like a crème brulee – but instead it has a lovely bite. 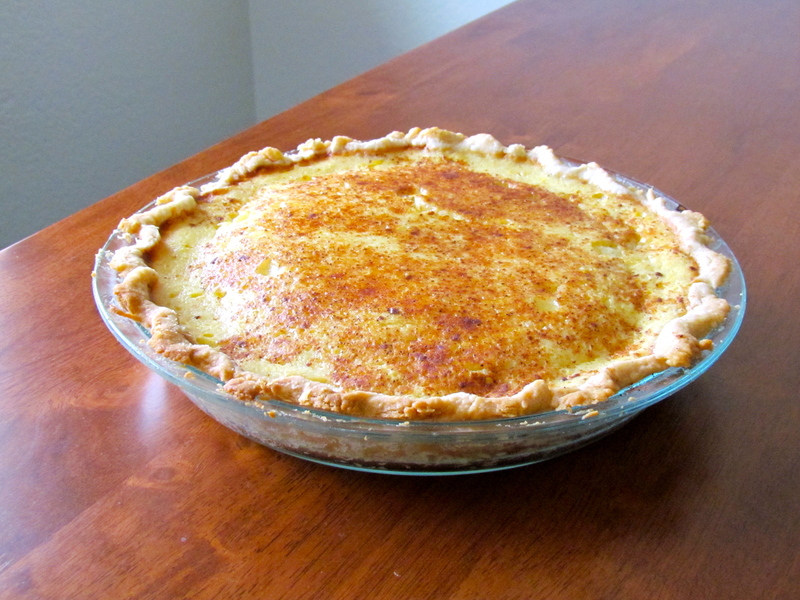 Although there is only a bit of lemon juice in the recipe the tart flavor shines through. It is very rich and one slim slice was plenty. I couldn’t eat a regular sized slice, my tastebuds would be overwhelmed! If I were to pair it with a meal, I would suggest something light and refreshing, like a salad. No whipped cream needed for this pie, but it would be great served with fresh berries. Thanks for joining me for the first ever Slatebreakers pie review! Reviewed from library copy, so I really hope I didn’t get any food stains on the book while baking. This entry was posted in Middle Grade, Reviews and tagged baking, Historical Fiction, Middle Grade, Mystery, pie, sarah weeks, taste test. Bookmark the permalink.